Brownies are a baked dessert bar, made with chocolate, which are a cross between a piece of cake and a cookie. Developed in the United States during the late 19th century, the bar cookies were popularized during the first half of the 20th century. Today, they are a favorite in lunch boxes, on restaurant menus, at pot lucks, picnics, bake sales, and as snacks. Variations abound, from the basic recipe to an array of flavorings (such as peanut butter, mint, coffee, raspberry, white chocolate or caramel), add-ins (like nuts, fruits, chocolate, or marshmallow) and layers (including glazes and frostings.) More recently the bars have taken on an identity as a health food in vegan, low-carb, low sugar, gluten-free, or high-protein versions. But to the basics first. Is it a cake or is it a cookie? By definition, a brownie is a cookie – more specifically, a bar cookie. A piece of cake is eaten with a fork. A cookie is finger food. Brownies are made in a pan, cut into individual portions, and are most often eaten with hands, not forks, placing them squarely in the cookie camp. Two words are most often connected with the bars are “cake-like” and “fudge-like.” The difference is associated with texture. A cake-like version has a lighter texture – similar to a cake. A fudge-like version has a denser texture, similar to fudge. A standard ratio of 1 cup of sugar to ½ cup flour gives the cookies a moist texture. The ratio varies from recipe to recipe – a higher level of flour in the ratio yields a cake-like texture, while more sugar (and fat and chocolate) produces a fudgier texture. Which is a true brownie – the cake-like version or the fudge-like version? It’s a matter of personal preference. You decide. The Cookie Jury is out as to who created the chocolate treat first – and where. 1893, Palmer House Hotel chef, Chicago. A chef at Chicago's famed Palmer House Hotel is credited with creating a baked chocolate bar dessert at the request of hotel owner’s wife. Bertha Palmer wanted a special treat appropriate for box lunches for ladies attending the 1893 Columbian Exposition (World’s Fair) in Chicago. The Palmer House Brownies were laced with walnuts and topped with an apricot glaze. The chef’s name has since been forgotten, but his concoction marks the treat's first recorded public appearance. 1897, Sears Roebuck Catalogue. A dozen, listed under “Fancy Crackers & Biscuits,” sold for $1.50. 1907, Maria Willet Howard, Boston (by way of Bangor, Maine). Maria, in Lowney’s Cook Book, called the treat Bangor Brownies, crediting a woman in Bangor, Maine with the concoction. The Bangor recipe was similar to Fannie Farmer’s, yet with an extra egg and an additional ounce of chocolate, creating a richer, fudgier texture. 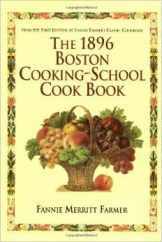 Other published recipes for the bars appeared in the Home Cookery (1904, Laconia, NH), Service Club Cook Book (1904, Chicago, IL), and The Boston Globe (April 2, 1905). So who gets the credit? Regardless of who first invented the confection, it grew in popularity as chocolate became more readily available to the consumer. In addition, the term became recognizable elsewhere, possibly lending itself to the bar cookie’s notoriety. Palmer Cox (1840-1924), a Canadian author and illustrator, penned a series of popular comic strips and books titled The Brownies, documenting the escapades of mischievous elf-like sprites. The Brownie, a simple consumer camera which made photography available to the general public, was introduced by Eastman Kodak Company in 1900. Sometimes called “blonde brownies” or “butterscotch brownies,” blondies are a variation flavored with brown sugar, rather than chocolate. Blondie recipes typically do not call for any kind of chocolate in the dough.